The physical body is ensheathed by auric field in which seven major chakras (invisible to the naked eye) are present. 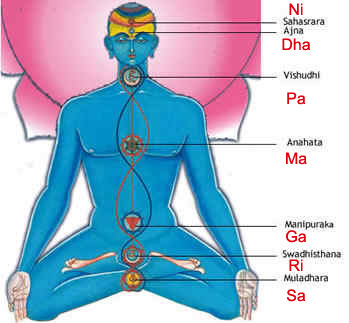 The seven chakras are Sahasrara, Ajna, Vishudhi, Anahatha, Manipura, Swadhistana and Mooladhara. Each chakra is associated with an endocrine gland and controls specific organs. Each swara resonates with one major chakra. When each note is sung concentrating on the shruthi, vibration of the corresponding chakra can be experienced. According to an ancient Indian text, Swara Sastra, the seventy-two melakarta ragas (parent ragas) control the 72 important nerves in the body. It is believed that if one sings with due devotion, adhering to the raga lakshana (norms) and sruti shuddhi, (pitch purity) the raga could affect the particular nerve in the body in a favourable manner. This entry was posted in Music Therapy. Bookmark the permalink. Thank You very much for your valuable comments,Sharat. Keep reading. I will come out with more findings. Thank you Sudha for your comments. Pls. visit often. I shall try to find some more time to continue writing the blog. Welcome to my blog. Pls. keep visiting. Also visit Raga Appreciation Page for Raga Infos and Downloads of songs for those particular ragas. Om Namahshivaaya – Sagara Sangamam or Silanga Oli. Most filmy numbers are in Sindhu Bhairavi, Anandabhairavi and Nata bhairavi Ragas. What i would suggest is to go for pure carnatic instrumental or vocal songs in these raags for better effect.